Leading Wholesale Trader of cilanem 500mg inj from Chennai. Cilanem 500 mg/500 mg Injection is used in the treatment of serious bacterial infections. 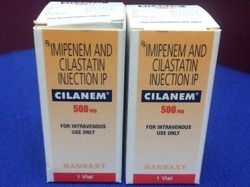 Cilanem 500 mg/500 mg Injection is a combination of two medicines: Imipenem and Cilastatin. Imipenem is an antibiotic. It works by preventing the formation of the bacterial protective covering which is essential for the survival of bacteria in the human body. Cilastatin is dehydropeptidase I inhibitor which blocks the activity of an enzyme (dehydropeptidase I) that causes breakdown of Imipenem. Hence, it helps Imipenem stay active in your body for a longer period of time.